Welcome back, gals and pals, to another Comic Book Wednesday! Last week I presented you with Fishnets' Guide to New York Comic Con. Now, sadly, due to my work schedule over at the Image Comics booth, I was not able to attend any panels. For coverage of panels (and other con stuff) I would recommend checking out CBR and Comics Alliance. Of course, The Mary Sue also had some great con coverage, including a fantastic article about harassment issues. But what did I do, you ask? What did I see? What interesting things happened at the hive of scum and villainy that was the Jacob Javits center? How many times did I make that joke this past weekend? (Answer: A lot). 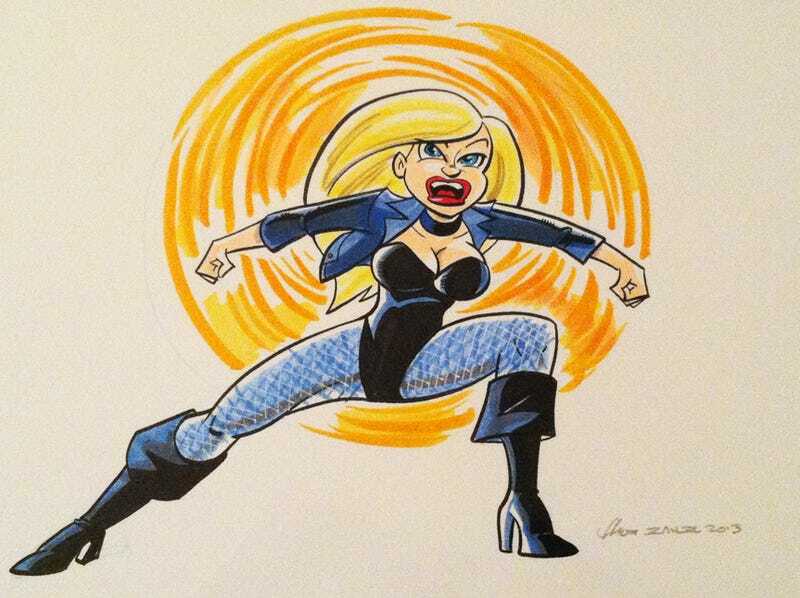 Comic Book Wednesdays: Fishnets&apos; Guide to New York Comic Con! So, Thursday was the day of scoping out the show. Mr. Fishnets and I got there early in the day, way before the con opened to the general public. We helped break down boxes and be generally helpful at the Image Comics booth, where both of us were volunteering in exchange for con tickets and a whole bunch of swag. After helping there, we wandered around and watched the rest of the exhibitors put the final touches on New York Comic Con. We headed over to Artist's Alley, which was so big this year that it took up an entire hall of the Javits Center. It was still pretty early so most of the artists weren't there yet, or were just starting to set up. Obviously, you don't bother people while they're setting up, so Mr. Fishnets and I wandered up and down the aisles, taking a look at the names on the tables, and going "ooh, I want to talk to him/her" or "Oh, I've got that book at home. Maybe I'll bring it to have it signed." At the time I had a couple of books on me, so I made a note to get back to Artist's Alley before my shift began at 5PM. Mr. Fishnets and I walked back over to the main exhibition hall, where people were selling ALL THE THINGS. Mr. Fishnets considered buying a set of Dragon Balls (no, the kind from DragonBall Z. Get your hivemind out of the gutter, GT). By then, 3PM was upon us and Mr. Fishnets had to get to the booth. I wandered around the exhibition floor for a bit and then went right back to artist's alley. I ended up at Amanda Conner's table, where I was pleasantly surprised to learn that she remembered me from previous years! She and I had a great conversation about the new paper she's using for her prints (which are absolutely gorgeous) and I began to eye the She-Hulk Vs. Iron Man print she had for sale. After that, I wandered around and snapped some pictures till I had to go over to the Image booth. I only had a little bit of time, but here's some cool cosplay I saw from that day. The 8-Bit Ghostbuster's patch is a really nice touch. This Desna and Eska cosplay was one of my favorites of the entire con. And considering we're barely into the new season of Korra, it's impressive how fast these two put these amazing costumes together! This was the day's winner though. Inspector Gadget with a WORKING PROPELLOR HEAD. Go go gadget awesome! Friday was the day of the lines. Like seriously, I spent the majority of my free time on Friday waiting on a line. One line in particular, but we'll get to that. My day started off with a line! On Thursday, we had seen people walking around with the exclusive Rocket Raccoon plush that Marvel was selling and I wanted it badly. I wasn't the only one who wanted one though. Everyone and their mother (quite literally in some cases!) wanted one too. On Thursday, the line was over two hours long. We got there before the show opened, and even being on the line before most people showed up to the show (thanks exhibitor badge! ), Mr. Fishnets and I still waited for well over an hour. It was crazy. I think a lot of the line was made up of people who were looking to flip it on eBay, proven by the insane amount of people already listing it there for way more than I paid ($35). The line was made slower by the fact that Marvel was only taking credit cards, no cash. They were claiming it's because they didn't want to manage a lot of money, but considering booths like Mattel were doing the same amount of business and taking cash, I thought this was kind of silly. While waiting on the line, I was able to step off and leave Mr. Fishnets, in order to go pick up the Super Best Friends Forever Poison Ivy figure that DC was selling! Whoo! She is so cute, and looks just like she does in the short. Yay yay yay! After that, it was off to Artist's Alley! Mr. Fishnets got on yet another line to get a sketch from Street Fighter artist Alvin Lee, who he tries to get a sketch from every year. I walked around where I ended up chatting with Jill Thompson, who is one of my favorite artists. She sketched a cute little Delirium in my 'Lil Endless Storybook and told me that there will soon be more Beasts of Burden, which some of you might recall was on my 5 Comics You Should Read list. She told me that Evan Dorkin written some amazing scripts that will make everyone cry their eyes out. She even started tearing up while just thinking about it! I went over and spoke to Nicola Scott, who is one of my favorite pencillers in superhero comics. She signed the Birds of Prey trades that she had worked on. 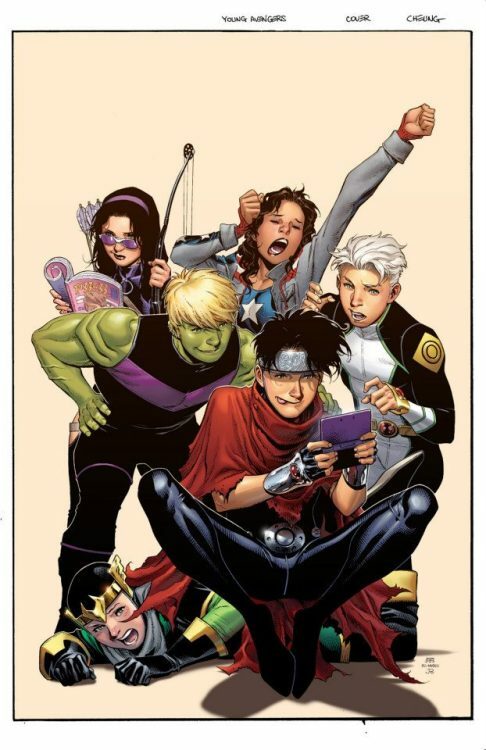 I then went over to Jim Cheung, co-creator of the Young Avengers, where two cool things happened. First, I got two awesome Young Avengers prints (the original team and the new team) and an original sketch of Kate Bishop. Secondly, I ran into Kotaku's Evan Narcisse, who has read Comic Book Wednesdays! I mentioned I write on GroupThink and he said "I like a lot of the stuff that comes out of there. They had a really good piece on Emma Rios a little bit ago." I was so proud to be able to say "Yeah, I wrote that." It was a good feeling. The rest of Friday was unfortunately spent waiting online. I waited for 4 hours for Mr. Fishnets (who had to head to the Image booth) to get that Alvin Lee sketch. It had never taken that long before for a sketch by Alvin Lee, and Mr. Fishnets felt awful that I had wasted so much of my time. He bought me that Amanda Conner print to start making up for it (and he went and picked me up Pokemon X the next day). The print is signed "To the best girlfriend EVER". Because of the line waiting, and some grumpiness due to line waiting, I didn't get to snap any photos. Ah, Saturday. Saturday, saturday, saturday. For those of you who go to cons, you know that Saturday is the BUSIEST DAY OH GOD WHY ARE THERE SO MANY HUMANS. Because of this, I avoided the exhibition hall as much as I could and spent most of the day, before my 3pm shift, in Artists's Alley shmoozing with more people. I like Artist's Alley a lot. I can get physical stuff almost anywhere else (except for exclusives, of course) and I can get comic news from pretty much all over the internet. But to get the chance to meet people who you really admire? That's the best part of the con for me. We did do a little shopping at first. We ran into my friend, who works at the comic shop and doesn't get a lot of time at con, so we hung out with him. He wanted to buy some stuff from the Mattel booth, and then we swung by Kidrobot and the Monster Factory (where I picked up some stuff for Momma Fishnets). I also grabbed some swag from the Divergent booth. I can't wait for the final book. But then it was Artist's Alley or bust. We hit up some of my favorite people, including Katie Cook, Art Baltzar and Franco (who told us of the return of Tiny Titans! ), and Thom Zahler. I'm not going to lie, I geeked out pretty hard when I met Thom Zahler. Love and Capes is one of my favorite books (as Mr. Fishnets puts it "it's the best Lois and Clark story without Lois and Clark"). I got sketches from all three- a Wonder Woman from Katie, a mother/daughter Black Canary piece from Art, and the stunning Black Canary from Thom Zahler from above. That's totally the best thing I got at Comic Con this year. That's a great Harley. I love that she actually made the giant mallet. There were a lot of Booker's and Elizabeth's wandering around, but this Boy of Silence was the best Bioshock: Infinite cosplay I saw. After making me wait on line all day on Friday, I put out a bounty on Mr. Fishnets. Mardi Gras Buzz Lightyear. To Infinity and Beyond! The Greendale Human Being! Particularly appropriate since I got Jim Mahfood to sign the Kickpuncher Comic that day. I saw a couple of Miles Morales cosplays, but this one was my definite favorite. Sunday is always a little bittersweet. You're happy that it's the last day of the con because you're exhausted (I coma'd on Saturday), but you're also sad cause it's the last day of the con because then you have to back to real world. You don't get Mardi Gras Buzz Lightyear in the real world, dammit. Still, we made the best of it. Mr. Fishnets and I were pretty broke by Sunday, so we spend most of the time we weren't working with Image Comics wandering the con taking it all in. Once again, I stopped by Artist's Alley. I chatted with some really cool people like Alison Sohn, Karen Hallion, and Tim Chamberlin- whose webcomic Our Valued Customers perfectly sums up what it's like to work in a comic store. That Korra was so good that I forgave her for spoiling the most recent episode for me! This Mr. Freeze was no joke. I was super impressed by all the details. One of the Mass Effect comic writers gets to meet an awesome Wrex puppet! He didn't have a real jetpack (though his backpack said "JETPACK WHOOSH!" on it), but I was really impressed by that Rocketeer helmet. Well, that's all from this NYCC. Anyone else have cool stories or scored some cool swag? I'd love to hear about it!